Peonies grow from crowns buried in the soil. When the plants are 3 to 5 years old, dig up the peonies and divide the crowns. Dig peonies in the late fall and early winter; the American Peony Society suggests digging between October and December. If the ground freezes hard in your area, plan to dig before the first hard freeze. After digging and dividing the the peony crowns, transplant a few to a new garden, or pot up the extra plants and give them to a friend. Cut the stalks down to 1 inch above the ground. Use a sharp pair of pruning shears to make clean, even cuts. Place your shovel 6 inches from the base of the stems and drive it into the soil, remove the shovel and continue until you have cut all around the roots. Go around once more driving the shovel in to a depth of at least 14 inches. Pull back on the handle of the shovel and lift the root ball from the soil. The roots will snap free from the soil as you lift the crowns. Gently turn the peony over so that it is resting on the stalks with the roots up. Using a dowel, loosen the root ball and remove the dirt from the root system. Spray the roots with water to remove all residual soil. 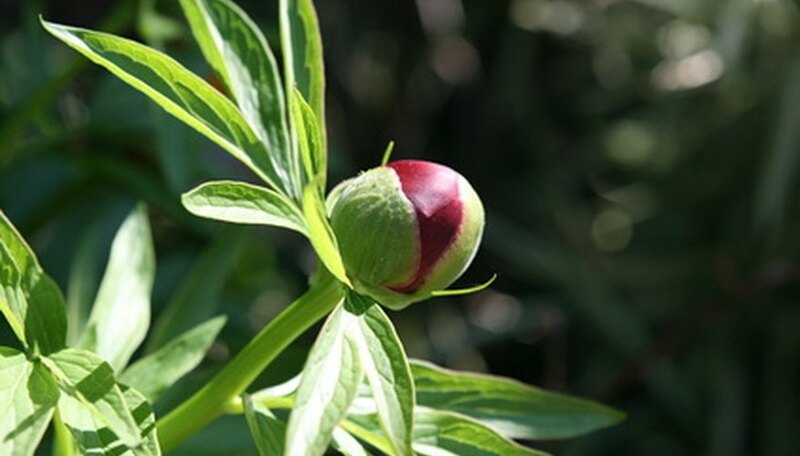 Place the peony crowns to cure in a shaded area for 24 hours before you begin to divide the root ball. Soak the soil around the peony roots before you begin to dig. The soil should be damp but not muddy, if the ground is already wet from recent rain, you don't need to add more water.